The Pelican iM2075 Storm Case with Padded Dividers (Olive Drab) is an injection-molded case made of HPX high performance resin, that is virtually unbreakable, dent-resistant and shatter-resistant. It is tough, rugged, lightweight, airtight and watertight. There is a permanently attached Vortex valve that automatically adjusts air pressure without letting in water, and won't unscrew from the case. Press & Pull latches open with the push of a button, yet stay closed securely under impact or stress. The case has unbreakable molded-in hasps that allow the addition of standard size padlocks. It has hinges with integrated feet that hold fast under impact, and create a flat surface for upright stability. It is carried by a double-layered, soft-grip, solid-core handle that provides strong, durable comfort. This case has a cushioning system with movable padded dividers and "hook and loop" closure. There is a convoluted foam pad in the lid. 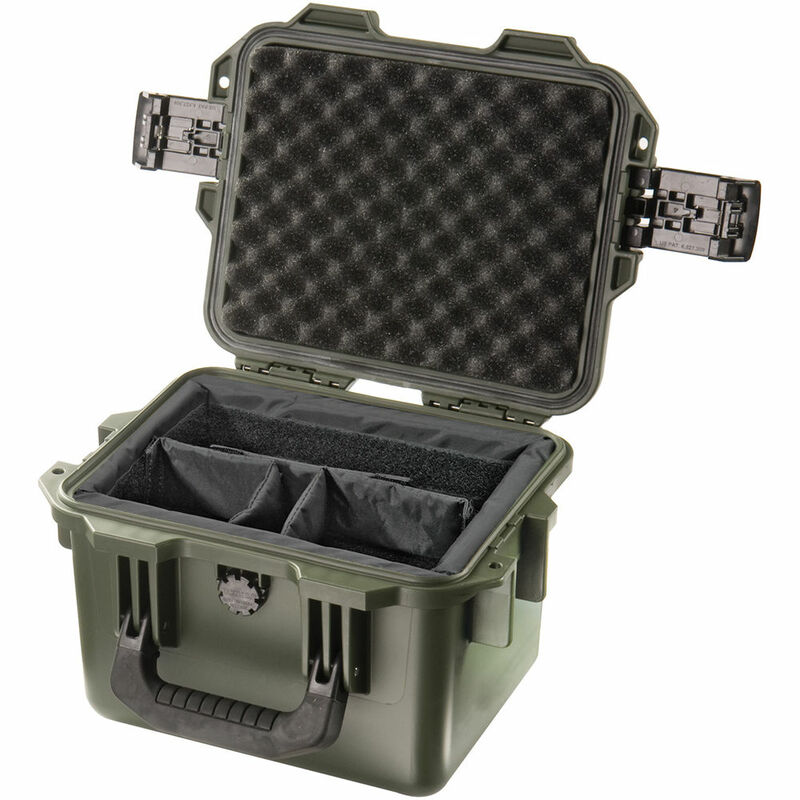 Box Dimensions (LxWxH) 12.0 x 10.5 x 8.1"
iM2075 Storm Case with Padded Dividers (Olive Drab) is rated 4.7 out of 5 by 9. Rated 5 out of 5 by nommek from Greatness in Plastic If there's ever a zombie apocalypse, I want pelican cases between me and any approaching danger. These things are extremely tough. They don't break, they don't leak, they don't crush. Treat them like your ex treated you. They can take it. If you have something expensive and/or breakable, the best place for is in one of these. The only negative is that they tend to be very heavy. Make sure you are cool with the weight of the case and what you plan to put in it. A big Pelican full of gear can be HEAVY. All of my bigger Pelican cases have wheels. Rated 5 out of 5 by palmer1076 from Ultimate Protection I use this to carry a camera, lens, and flash deep into a wild and wet caves, and on canoe and kayak trips. The case holds a Nikon 7100 DSLR with a 18-140mm zoom lens, a 10-20mm wide angle and a SB800 strobe. This is a pretty tight fit. The motor base makes the camera too tall for the case. Here is a hint to ordering the correct size: Check the inside measurement of the case you are considering. Find a cardboard box and make a model the same size by cutting and taping. Place your items in the cardboard box to see if they will fit. Allow some extra for the padding. The padded dividers allow me to change the configuration of the case. This is a much better arrangement than the foam that allows for a one-and-done configuration only. I especially like the latches of the Storm case over the regular Pelican case. The latches of the Storm case open and close much more easily. I chose yellow for visibility and to be stylish; my friends all have black cases. I also slightly modified the case by drilling small holes into each of the fins on the outside bottom of the latch to allow the placement of a shoulder strap for carrying when walking. These are expensive cases but considering what is inside and they are a bargain. Rated 5 out of 5 by WILLIAM from Excellent but size makes a snug fit Typical high quality Pelican product. Latches are much easier to use than on my other Pelican case. Watch the sizing since the padded dividers take up a fair bit of the internal room. Each side of the case looses about 1/2 due to the thickness of the padding. Perfect fit for a Nikon D800 and 28-300 for kayaking. Rated 4 out of 5 by Alfredo from Good packer! This box is a good size for all your POV cam and accessories. The only negative is that it only has one long divider and two short ones. I had to use some Velcro dividers from another camera bag to further compartmentalize it. Now it's perfect. Rated 5 out of 5 by SamwiseTheBrave from Solid case for smaller items. Great case, we use it for just about everything. Solid construction, light weight. Rated 5 out of 5 by Mark from Great for protecting large lenses, Etc. I use this for a Phase One 40-80mm lens and it provides excellent protection. Rated 4 out of 5 by Anonymous from Tough little nut Smaller than I expected, but still does the job.